According to a Greenpeace study released this week, Hainan province’s rainforests in central mountain region have been disappearing at a rate of about 200,000 square meters every day for the past ten years because of illegal logging and plantation establishment. That amount of deforestation is equivalent to losing 27 football fields of RAINFOREST every day for the past 10 years. 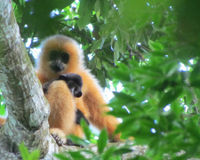 Hainan’s rainforests are home to the world’s rarest primate, the Hainan gibbon, of which it is believed that only 23 remain in the wild. "When you have just 23 of a particular animal species left in the wild, that says we humans aren’t being good stewards of the environment," said Greenpeace forests campaigner Yi Lan. "A lack of enforcement brought about this rapid loss of rainforest and it’s about to bring about the extinction of a species."